Lumber is crafted with a Log and a Saw. Lumber can also be recovered from their block form using a saw. 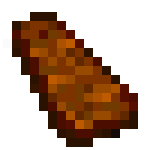 Lumber is used to build most wooden items, as opposed to the plank blocks used in vanilla Minecraft. The following recipes must be made with lumber of the same type. The following recipes can be made with any combination of wood types. 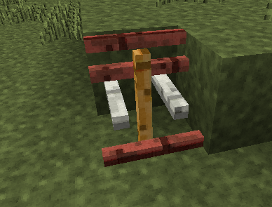 Lumber can be placed in the world by right-clicking a piece of lumber against the face of another block. The face being clicked against is divided up into an 8x8 grid, allowing for the lumber to be placed in any of 64 different positions. Multiple pieces of lumber may be placed into the same block and even at right angles to each other. If you break one piece of lumber in a given block all of the lumber in that block will be broken and become retrievable items. Axes give 4 planks, saws give 12. Chest Recipe changed to use the new planks. Added recipes for doors, trapdoors, and signs using plank items. Making planks with Axes yields 3 planks, down from 4. Making planks with Saws yields 8 planks, down from 12. Single planks can be placed on any surface for Wood Construct blocks. Removed axe recipe for crafting plank items. Added fence and fence gate recipe. Planks can be recovered from their block form. Temporarily disabled the armor stand recipe. Removed splitting of plank blocks into plank items by hand, must use a saw. Plank items renamed to “Lumber” to hopefully reduce confusion between the item and the block. Chest crafting recipe is wood-specific. Placing too many pieces of lumber within a relatively small area will lag and/or crash clients. Lumber of different types of wood mixed in the same block. This page was last modified on 12 July 2015, at 19:32.